By now, the social RPG genre has found a pretty comfortable groove. Take some kind of battle mechanic, staple the now-standard collect, fuse, evolve leveling system onto it, and make sure you have an ever-expanding line-up of desirable goodies for players to chase after. The recipe is simple enough, though finding success with it is another matter. There’s a lot of competition, and players have got to be getting a little tired of the same old. That’s likely as good an explanation as any for why the social RPG genre has started to stretch its legs out a little. If there’s one company that has been trying seemingly every permutation of features to try to score a hit, it’s Square Enix. Very few of their efforts have ever left the shores of Japan, but that might be starting to change. Not long ago, we saw a wide release for Kingdom Hearts Unchained Chi (Free), and now we’ve got one for Final Fantasy Brave Exvius (Free), Square’s collaboration with Brave Frontier (Free) developers Alim. As team-ups go, it’s a wise one. Although the social RPG genre is massive in Asia, few games have managed to make much of a dent in the worldwide market. The most successful ones have been Puzzle & Dragons (Free), Final Fantasy Record Keeper (Free), and Brave Frontier. Square’s done a few guest events with the first and obviously had a lot to do with the second, so why not complete the hat trick? 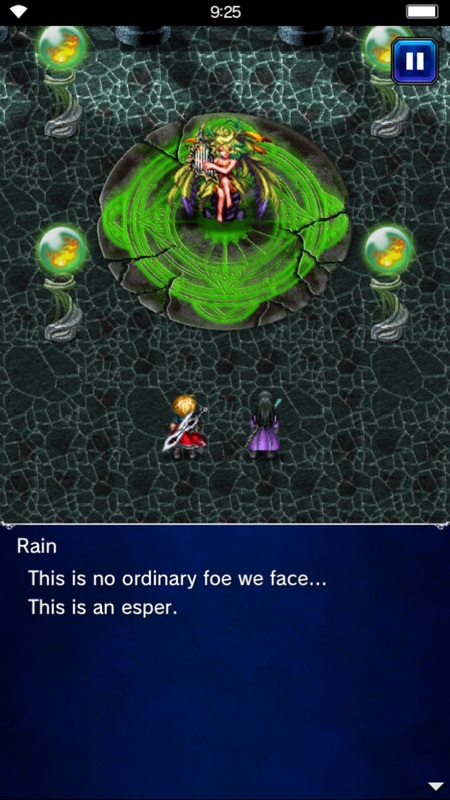 After all, if Brave Frontier was a hit, surely Brave Frontier with Final Fantasy characters will do even better? But Brave Exvius takes things a few steps farther than a mere reskin. The battle system offers a bit more depth, and you can now explore towns and dungeon-like areas filled with treasures and random battles. They’re not particularly complex dungeons, but it’s certainly more than we usually get from this genre. The end result is something that is neither fish nor fowl, and I’m not sure how I feel about that. 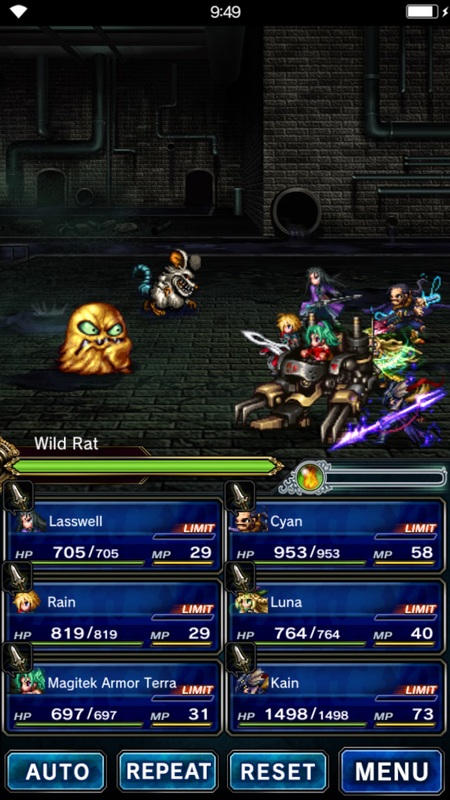 In a sub-genre mostly known for short and sweet experiences, Final Fantasy Brave Exvius often feels positively plodding in its pacing. It’s dialogue-heavy, and the towns and dungeons are just long enough that it can take a few minutes to navigate them. If you’re at a point where you just need to battle a few rounds, then you’ll be just fine, but in other situations, this isn’t the best choice for a quick time-killer. The game fares better as something to sit down with when you have some time to devote to it, but taken from that angle, the free-to-play hooks greatly detract from the experience. Your session only lasts as long as your stamina meter, and while it’s initially generous, you’ll eventually hit a point where you can’t do more than a few missions with a full meter. I suppose this is what growing pains look like. I appreciate that, like Kingdom Hearts, Brave Exvius is trying to put a little more JRPG into the social RPG framework. It just feels like we’re not quite there yet. It doesn’t help that although many of the important elements are present, they’re just not all that well-done. The dialogue and banter between the characters is the main vehicle for telling the game’s story, but it’s dreadful stuff even by JRPG standards. The dungeons, while realistically more complicated than about half of the ones found in Final Fantasy 13, don’t involve much more than working your way through a simple layout pushing against the walls to try to find hidden passages. And while the battle system offers strategic options, it rarely presses you to use them. Which isn’t to say that there aren’t some tough battles, but more often than not, brute force wins the day. At the very least, it’s a more fully-featured game than Brave Frontier is. Characters have more options in battle, and you have more options for decking each of them out in terms of gear. The exploration aspects are interesting enough, and the game feels on the whole a bit gentler in its balancing. 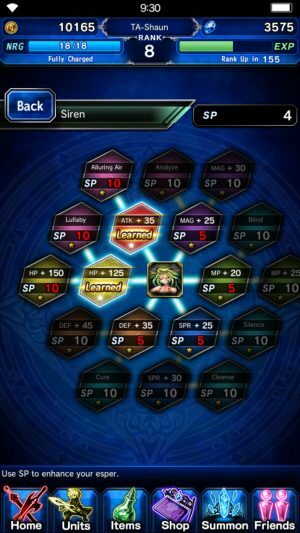 Most of Brave Frontier‘s strengths have survived the transition, too. The battle graphics are wonderful. Not that I don’t have a nostalgic love for the classic pixel art of the Final Fantasy games, but it’s interesting to see a larger, more detailed take on characters we know and love. The visuals outside of battle don’t impress quite as much, but they’re competent enough. The basic combat mechanic of turn-based tapping is easy to use, and the overblown effects from big attacks are exciting. Almost all of the usual social RPG stuff is in Brave Exvius, of course. You have a stamina meter, limited inventory space, the ability to use your friend’s character in battle, a billion and one ingredients to collect for crafting and evolving, random gatcha draws, and a premium currency that is doled out frequently enough for a free-play gamer to get by, if not much more than that. Even with new ideas like dungeons and towns, the structure is mostly familiar. You’ll enter a new stage, fight a series of battles with a tougher boss-type battle at the end, then head to the next stage. Once you’ve cleared all the stages in an area, exploration mode opens up, which allows you to wander around, look for treasure, and get in as many fights as you like. The occasional town allows you pick up new gear and solve sub-quests. Outside of the story mode, there are limited-time stages that help you earn gil, experience, or crafting ingredients, and a colosseum. It’s all quite standard, and if you’ve played a social RPG before, you’ll feel pretty comfortable. Realistically, however, most players are going to be here for the fanservice, and that aspect is done well. 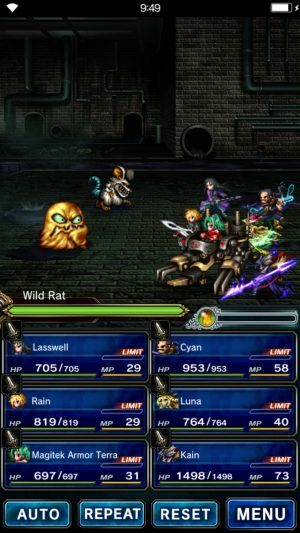 Most of the games in the series are represented in Brave Exvius, and the enemies are almost entirely drawn from franchise mainstays. As you play through the game, you’ll unlock familiar summons, and the music naturally contains the familiar riffs and melodies that have echoed through the franchise. Your first set of pulls from the game’s premium gatcha draw will almost certainly include someone familiar, and their stats and abilities are largely faithful to their original forms. Also, there’s white text on a blue dialogue bubble, which means this officially satisfies the requirements of the series creator of being a Final Fantasy game. If you just want your Final Fantasy fan-belly scratched, Brave Exvius will happily do that for you. If you’re not a Final Fantasy fan, Brave Exvius will likely come off the same as any other social RPG. Other than its flirtations with pulling in more JRPG traditions, it’s a fairly unremarkable example of the genre. It’s well-made, and fairer than Brave Frontier was over the long haul, but in hewing as closely as it does to that years-old game, it ends up feeling a little out-of-date. I appreciate the olive branch it seems to be extending to fans of classic JRPGs, but those aspects feel a bit half-baked, dragging down the pace of the game and causing it to feel somewhat dull at times. It’s worth a shot if you’re a fan of Square’s classic RPG series, but in trying to stretch out to two different camps, I fear it may not entirely please either.